BioShock Infinite: Burial at Sea - Episode Two (STEAM) 95 р.
BioShock Infinite Columbias Finest (Steam key) -- RU 145 р.
Bioshock Infinite: Columbia`s Finest 145 р.
Bioshock Infinite: Columbia's Finest (Steam | RU+UA+KZ) 149 р.
BioShock Infinite Burial at Sea Episode Two 2 STEAM KEY 179 р.
BIOSHOCK INFINITE ?ЛИЦЕНЗИЯ STEAM + БОНУС 183 р.
BioShock Infinite. STEAM-ключ+ПОДАРОК (RU+СНГ) 183 р.
BioShock Infinite: Burial at Sea - Episode Two // STEAM 197 р.
BioShock Infinite ✅(Steam ключ)+ПОДАРОК 205 р.
BIOSHOCK INFINITE (STEAM) + ПОДАРОК + СКИДКИ 205 р.
BioShock Infinite (Steam) RU/CIS 205 р.
BioShock Infinite (steam key) -- RU 213 р.
BioShock Infinite (Steam KEY)RU + ПОДАРОК 219 р.
Bioshock Infinite: Columbia's Finest STEAM KEY GLOBAL 219 р.
BioShock Infinite (Steam) 220 р.
BioShock Infinite Clash in the Clouds (Steam) -- RU 238 р.
BioShock Infinite: Burial at Sea - Episode One (STEAM) 249 р.
Bioshock Infinite - Steam Key - RU-CIS-UA + АКЦИЯ 258 р.
BioShock Infinite (Steam key)CIS 299 р.
BioShock Infinite (STEAM KEY / RU/CIS) 299 р.
BioShock Infinite: Season Pass. Ключ+ПОДАРОК (RU+СНГ) 329 р.
BioShock Infinite Season Pass✅(Steam Key)+ПОДАРОК 345 р.
BioShock Infinite (Steam Key | Photo) + СКИДКИ 349 р.
BioShock Infinite (Steam KEY) + ПОДАРОК 355 р.
BioShock Infinite Burial at Sea Ep. 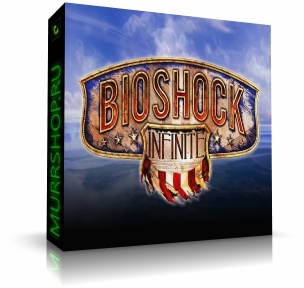 2 (Steam) -- RU 357 р.
BioShock Infinite Burial at Sea Ep. 1 (Steam) -- RU 357 р.
BioShock Infinite Season Pass STEAM KEY REGION FREE ROW 370 р.
BioShock Infinite Steam Gift/ RoW / Region Free 375 р.
BioShock Infinite - Season Pass (Ключ активации Steam) 379 р.
BioShock Infinite Season Pass (Steam) +ПОДАРКИ и СКИДКИ 399 р.
BioShock Infinite (Steam Gift ROW / Region Free) 399 р.
BIOSHOCK INFINITE - STEAM - 1C - ФОТО + ПОДАРОК 425 р.
BioShock Infinite (Steam | Region Free) 489 р.
BioShock Infinite - Season Pass (Steam KEY) + ПОДАРОК 495 р.
BioShock Infinite (Steam Gift RU+CIS) 497 р.
BioShock Infinite Steam Gift RU/CIS 500 р.
BioShock Infinite (Steam region free; ROW; Multi Lang) 555 р.
BioShock Triple Pack (BioShock + BioShock 2 + Infinite) 569 р.
BioShock Infinite (Steam Gift \ ROW \ Region Free) 599 р.
BioShock Infinite + 1+2 - Steam - RU-CIS-UA + АКЦИЯ 599 р.
BioShock Infinite (steam cd-key RU,CIS) 599 р.
BioShock Infinite - Season Pass (Steam | Region Free) 606 р.
Bioshock Infinite (STEAM GIFT / Region Free) 620 р.
BioShock Infinite Season Pass (steam key) -- RU 719 р.
BioShock Infinite Season Pass (Steam key) @ RU 760 р.
Bioshock Infinite + Season Pass Bundle (Steam Gift ROW) 799 р.
Bioshock Infinite !Игра быстро! (Steam Россия) 850 р.
BioShock Infinite (Steam Gift | RU) 850 р.
Bioshock Infinite+Season Pass Bundle(Steam Gift ROW|WW) 999 р.
BioShock: Infinite The Collection (Steam Gift|RU+UA+KZ) 1 599 р.